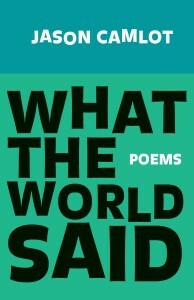 Today's book of poetry: What The World Said. Jason Camlot. A Stuart Ross Book. Mansfield Press. Toronto, Ontario. 2013. Jason Camlot is a gentleman subversive, a subterranean homesick-blues ball-busting counter-culture curve-ball throwing court jester. Camlot's fourth trade collection of poetry, What The World Said, could only be written by Camlot. No one else sees the world with quite the same lightness, all that dark vigor. count who's there, who isn't there. not counting the hour that you pray. count your steps towards mourning. 'Ugly sheep.' Count yourself lucky. Observe your family fast asleep. Return to your old pair of shoes. hum of what you cannot know. I'm sure there is a proper name for poems made of lists, (note to self: look up proper name for poems made up of lists), but I don't know it. Jason Camlot writes killer list poems. "What We Did", "Thirty-One Awakening", "After The Red Angle" and " Gehenna Is Not Hell" are four examples, they'd all fit loosely in the list category. When Camlot makes lists they sing with history, rhythm, mystery, humour, conflict, reason and inanity, sometimes people just want to see the firework in full flame, all the fuses lit. Camlot is a little like a guitarist or saxophone player sustaining a solo in these lists, magnifying a particularly satisfying riff. lurking in the back seat. You know we'll be there again tomorrow. Another tool Camlot employs is the full-on epic all-encompassing magic-thinking rant. He may not think of it as such but from this vantage point it is how I would describe his carefully articulated hi-jinx. How else would you explain something like the marvelous title poem "What The World Said". more learned in the Torah than me. (immersion in prayer) and respond. Jason Camlot's What The World Said is another shot across the bow from one of our most imaginative and articulate voices. When Jason Camlot speaks, I listen. Jason is the author of three previous collections of poetry, The Debaucher (2008), Attention All Typewriters (2005), and The Animal Library (2001).